The below categories show all our metal curtain poles in their relevant colour categories which will help you to find exactly what you’re looking for quickly and easily. All our poles are supplied as complete kits and are available in diameters ranging from 19mm (3/4") for light weight curtains and voiles to 50mm (2") for all domestic heavy weight curtains. 28mm (1 1/4") diameters are ideal for most medium to heavy weight drapes. 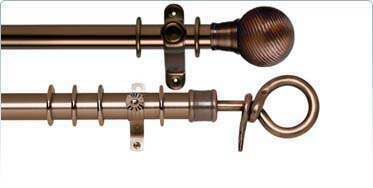 If you are looking for metal curtain pole brackets, rings and accessories, please visit our brackets and connectors section. 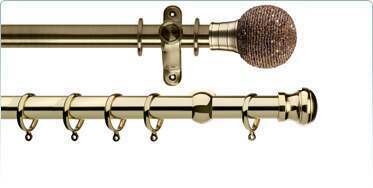 We are renowned for our huge range of curtain poles and this extensive collection of metal versions is no exception. 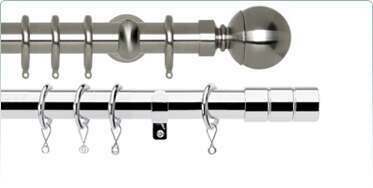 We are pleased to offered these metal poles in many colours and finishes to suit every style of décor. Chrome, steel and silver are often favoured for contemporary styled homes and apartments, the clean universal finishes coordinating well with all coloured fabrics and interiors. Gold and Brass has a elegant and timeless look often associated with a traditional décor, adding a feeling of warmth to the room. Bronze finishes are becoming very popular, looking particularly attractive against a pale wall colouring. 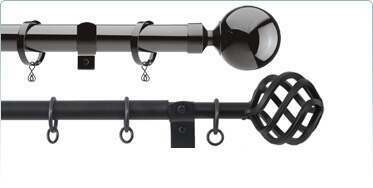 Black metal and Wrought Iron curtain poles have a rustic feel associated with old England. 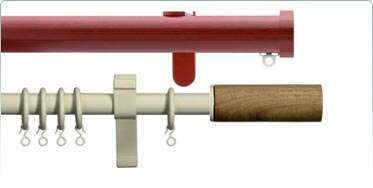 For more unusual colours, we offer a special finish collection which includes painted metal curtain poles. We are constantly updating and adding new metal poles as part of our commitment to bring you all the latest styles and trends. If you can’t find what you’re looking for then please contact us and a member of our team will be on hand to advise you.